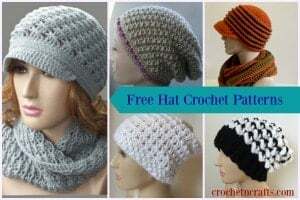 It is shown in one size only, but can be increased to any size you want including a cozy and oversized cowl for the winter. And since it’s so easy to adjust to any size, you can basically use any yarn and hook size that you have on hand. 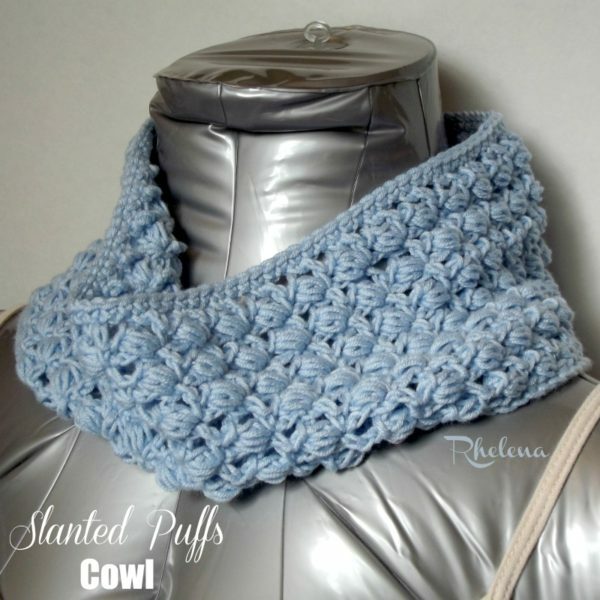 The Slanted Puffs Cowl is another addition in the Slanted Puffs series. The stitch pattern features a lovely lace, as well as a pretty texture that results from the puff stitch. The cowl has a gorgeous drape as well, which is all because of the lovely yarn: Cotton Fair by Premier Yarns. It’s a nice cool yarn that’s perfect for the summer. And it also gives you a lot of stretch in your fabric! So it’s definitely a yarn that I’ll try to use more often. It’s expensive, but definitely worth the price. Gauge: 3 st repeats: (sc, ch 3, puff st) = 2″. Finished Size: Laying flat it measures 11″ long by 4″ high. Puff Stitch (Puff st): [Yo, insert hk into st, yo and pull through] 3 times (7 loops on hk), yo and pull through all 7 loops. Ch 1 to close. Loosely ch 99 (or any multiple of 3 to get the circumference you need), join with sl st in first ch being careful not to twist. Rnds 5-14: Rep rnds 3 and 4. Rnd 15: Same as Rnd 3. This pattern is also available in a pdf format at Ravelry, Craftsy and Etsy for a small fee. And don’t forget to check out the free crochet pattern collection on CPB: Crochet Cowls. Do you work into the back bumps throughout the whole project or just the first row? Only on the first round.